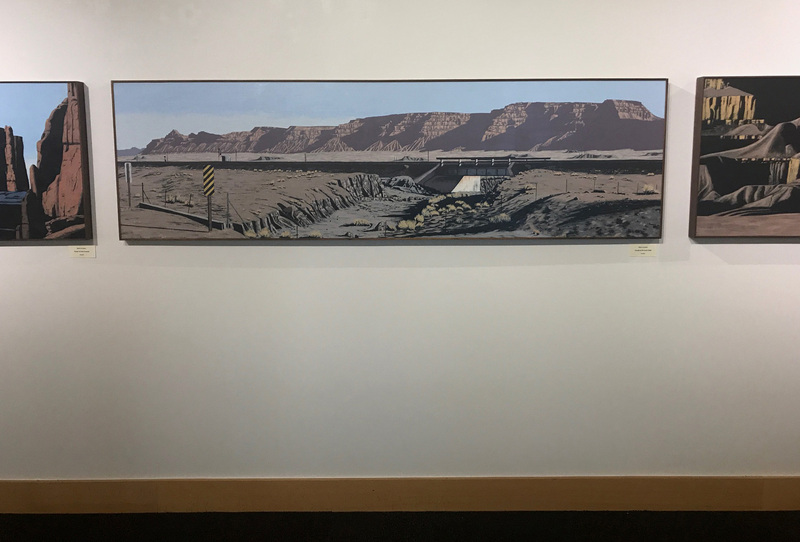 Their current exhibit, Utah Utah, is another visual treat from Mark Knudsen and Leslie Thomas, the pair of painters who, for the past decade, have been carpooling to work — call it Paint the Badlands, Inc. — before heading off to their individual departments for research and development. The Gallery at Library Square’s two exterior walls and four interior ones are split evenly between the artists. 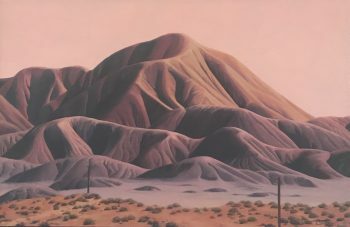 On an outside wall, a few of Thomas’ earlier works demonstrate her interest in the undulating forms of Utah’s badlands — the eroding hills of gray, mauve and ochre bands that surround the Colorado Plateau. 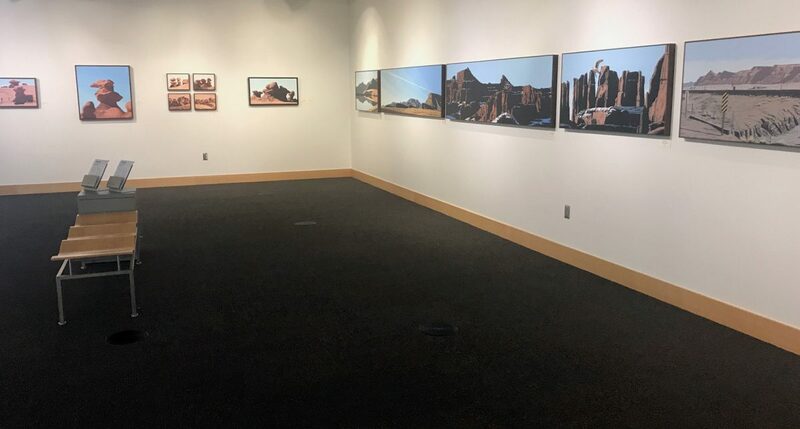 Her focus for the library, however, seems to be in the interior space, where she presents more than two dozen paintings, of various sizes, depicting the hoodoos of Goblin Valley. 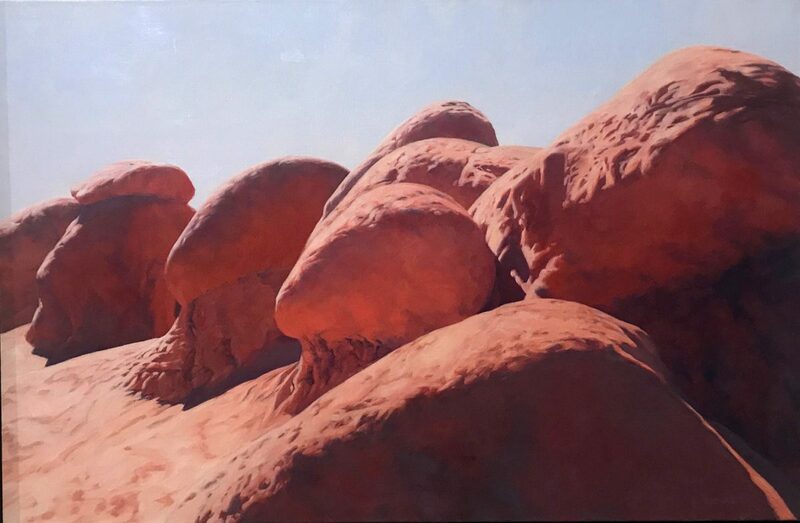 These mushroom-like forms, the result of harder, more compact stone sitting atop a more easily eroded layer, provide the artist endless visual material, both in color — Thomas takes delight in shadows full of velvety shades of carmine, indigo and purple — and composition — the large masses of stone and sky alternate for attention with a focus on small details. The hoodoos are depicted in individual and group portraits, and apart from a single work, where two young tourists are allowed to intrude on the compositions, appear unconcerned with our approval or contemplation, as content with their compelling majesty in the millenia before they were stumbled upon in the 1920s as in the decades since. While Thomas’ single inclusion of the human seems an unfortunate anomaly within her broader exhibition, it is central to Knudsen’s conception of painting “the new West.” With works dating back as far as 2005 and as recent as this year, Knudsen’s exhibition feels like a retrospective of sorts, one in which he revels in the un-picturesque practice of placing elements like highways, road signs and jet engine contrails in his landscapes. On the gallery’s west wall, a half dozen of his characteristically long canvases are placed almost end to end so they fill the entire space. 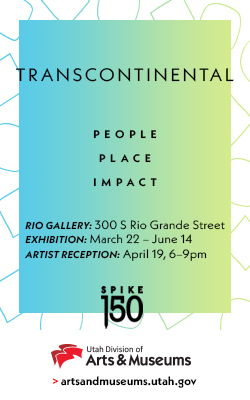 They alternate between highway scenes, featuring overpasses, ditches and semis, and dramatic redrock walls — like the memory of a road trip that includes both the destination and the journey. 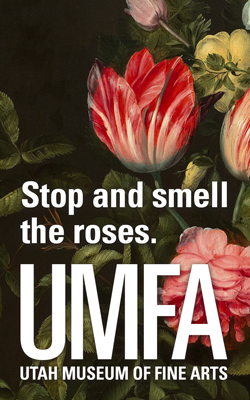 In a 2013 review, Geoff Wichert remarked on how much the choice of medium defines each artist’s work, which is evident in this show as well. Befitting a former newspaper designer, trained to create visuals that will read in an instant, Knudsen comes at the landscape focused on the most direct means of communication — laying in shadows, midtones and highlights with little modulation, an approach well-suited to his fast-drying acrylics. The works emphasize graphic elements, flattened shadows carving out forms on sandstone walls or cliffs of mancos shale. Meanwhile, in the oil department, Thomas concentrates on the flow — rather than the line — of light, spending as much time in the shadows as she does in the sun. While Knudsen’s light can be stark, Thomas’ is frequently ethereal. At the risk of oversimplifying, one could say that Knudsen communicates the idea of a landscape, while Thomas explores its feeling. Since Knudsen and Thomas have both proven they can hold their own with individual shows, it is unnecessary to compare and contrast these artists’ works to enjoy them; but, they have shown together so frequently and so well, that it seems inevitable. 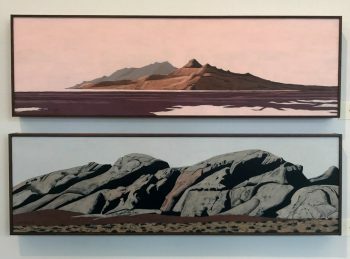 Just when you think Knudsen is all light and hard shadow, you see a work like “Antelope Island” which has the same caressing pink bath of light that can be found in Thomas’ “Wish You Were Here.” And while with this exhibit Thomas has staked out the hoodoos as her personal domain, she didn’t have to invent the process of composing with light and shadow from scratch to do it. Each has certainly carved out their own domain, with an individual style pursuing personal ends, but seeing their work together it’s obvious there have been plenty of interactions at the Paint the Badlands, Inc. water cooler — which is good for both consumers and shareholders. Utah Utah: Paintings by Leslie Thomas and Paintings by Mark Knudsen, Gallery at Library Square, City Library, Downtown, through Oct. 5.